22 April 2010, at 8:15a.m. UK - As part of Meriden's commitment strategy, Meriden explains its quality accreditations. Marketing Manager, Pippa Sprinks, said: "Feedback from the sales team tells us that confusion arises around the different accreditations that are available globally, therefore we would like to explain Meriden's quality procedures." Meriden is committed to providing quality service and products and is a registered QMS:ISO 9001:2008 company. The Orego-Stim® and Fusion® ranges have an additional advantage in that it has FEMAS (Feed Materials Assurance Scheme) approval. This prestigious scheme ensures the highest standards in each step of the production process, from raw material through to finished product, therefore offering full traceability of all the ingredients. FEMAS is a fundamental requirement within UFAS (Universal Feed Assurance Scheme) which ensures safe feed production. UFAS embraces all existing UK and EU feed legislation, Codes of Practice and legislation demanding HACCP and traceability throughout the chain. 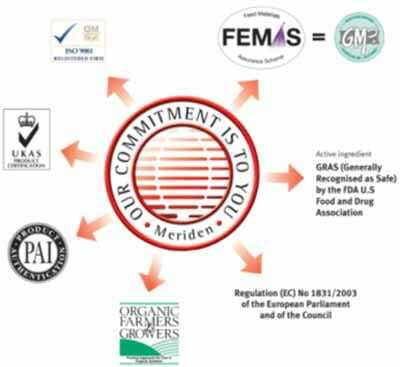 In addition, the FEMAS scheme has been recognised by the governing bodies to be equivalent to GMP+ from PDV (The Product Board Animal Feed) (Netherlands). The production site operates to GMP standards and holds a Medicines Control Agency manufacturer's licence for veterinary pharmaceuticals and Royal Pharmaceutical Society of Great Britain Category A registration.